This page will provide you with information about having an upper GI endoscopy. For further details, please speak to your consultant. The upper gastrointestinal (GI) endoscopy can also be named a gastroscopy. 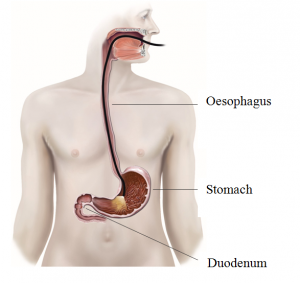 It is a method that uses a supple endoscope to inspect the oesophagus, stomach and duodenum to look for any issues or abnormalities (see Figure 1). What are the alternative forms of examination? Along with an upper GI endoscopy, a check-up can be carried out with a barium meal (an x-ray of the gastric system) or with a urea breath test, which will determine if the bacteria that causes stomach ulcers is present. What will happen during an upper GI endoscopy? A sedative may be needed if it is suitable for your individual situation. The process will take approximately ten minutes. The endoscope will softly be manoeuvered to the back of your throat where it can move down into the stomach and duodenum. A very small camera will give the endoscopist a chance to check for abnormalities or irritations such as ulcers or inflamed tissue. It is also possible to take tissue samples (biopsies) if needed, and pictures can be taken to aid in their judgment of your diagnosis. Patients will likely return home after the upper GI endoscopy and tend to be back to their normal routine by the next day, however this is subject to doctors’ advice. If you have had any sedatives you may need a few hours for the effect to fully wear off. It is also normal to feel a little bloated following this procedure. Your healthcare team will discuss your results and arrange any follow-up appointments needed. An upper GI endoscopy is a safe and effective way of diagnosing and examining problems with the gastric system. This information should not replace advice that your relevant health professional would give you.